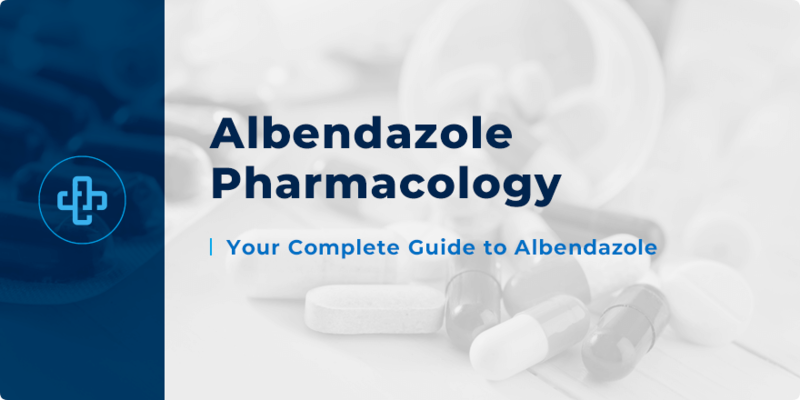 Albendazole Pharmacology | All the Facts in One Place! Albendazole belongs to the antihelminthic class of drugs – the word “helminth” coming from the Greek to mean “parasitic worms”, precisely what they are. And nor is this exhaustive. Albendazole also comes with a distinct side effect and drug interaction profile, much of which we explore below. First though, we need to talk about the fundamental mechanism of albendazole pharmacology; how the drug works to eliminate parasitic worms from the body. Inhibits beta-tubulin – inhibiting both polymerization and formation of microtubules. Glycogen depletion – albendazole diminishes glucose uptake by both larval and adult parasites. Inhibits cell division – the drug works to prevent formation of spindles, inhibiting cell division. Motility disruption – albendazole alters cell motility and intracellular transport mechanisms. Higher doses of albendazole further disrupts the wider metabolic processes – such as Kreb’s cycle – in the parasite. Less common side effects include temporary hair loss, agranulocytosis, skin rash, diarrhea, vertigo and hepatotoxicity. Albendazole is best absorbed at lower pH values (more acidic conditions). Fatty meals enhance albendazole absorption further, because the drug more effectively dissolves into lipids. The antiepileptic medicines, phenytoin and carbamazepine, substantially reduce plasma concentration levels of albendazole by up to 50 percent. The H2 receptor antagonist, cimetidine, substantially increases plasma concentrations of albendazole. Several other drugs are known to increase albendazole levels. These include corticosteroids, praziquantel (another antihelminthic drug) and grapefruit juice. Albendazole is classified as pregnancy category C – meaning that “risk is not ruled out”. Albendazole can only be administered via the oral route. It has an approximate half-life of 10 hours and it’s predominantly excreted through the bile. Albendazole is an important medicine, then, in combatting both mild and serious helminthic infections. Want to learn more albendazole pharmacology and other antihelminthic agents? Register with PharmaFactz today to receive instant access to our great resources. In the meantime, take a few moments to join our newsletter (above) to receive all the latest information direct to your email!